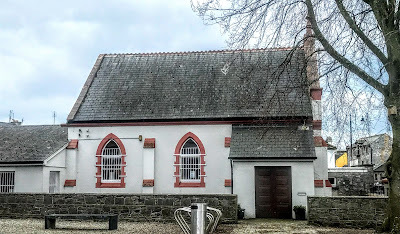 The former Presbyterian Church and the former Town Hall next door form an interesting pair of buildings on Banba Square in the centre of Nenagh, Co Tipperary, and they now serve as a tourist office and an arts centre. 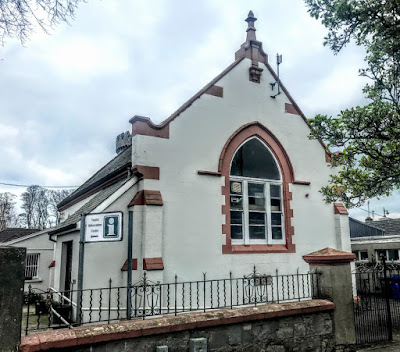 The former Presbyterian Church, built on the corner of Banba Square and Kickham Street in 1905-1906, was designed by the Dublin-born architect Henry James Lundy (1871-1964). Henry James Lundy was born on 5 June 1871, the eldest of the four sons of Hugh Lundy (1827-1912), from Co Cavan, and his wife Elizabeth (1847-1928), née Young, from Killucan, Co Westmeath. The younger Henry Lundy was a pupil from 1891 to 1895 in the office of the Dublin-born architect, William Henry Beardwood (1842-1930), who designed Roscrea Abbey, Co Tipperary. Beardwood’s brother, Dom Camillus Beardwood, who was the first Abbot of Roscrea, was born Joseph Beardwood and had also trained as an architect. By 1900, Lundy had established his own office in Dame Street, Dublin, and his pupils and assistants included Francis Peter Russell. He married Evaline Marion Spence, daughter of William Spence, an iron and brass founder, of Cork Street, Dublin, in 1901 and they were the parents of two sons, William and George. 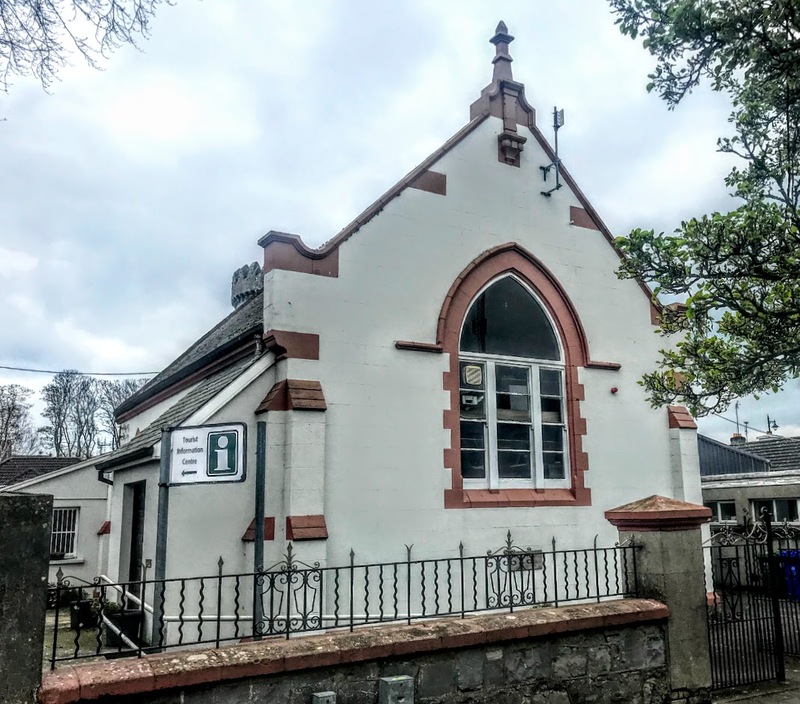 Tenders for a new Presbyterian church in Nenagh were invited in July 1905, and the church was designed by Lundy and built in 1905-1906 by Whelan Brothers of Dublin. Lundy designed a detached, T-plan church, with three-bay side elevations and a two-bay return. The terracotta dressings are by Beckett of Kingscourt, Co Cavan, and the lead light windows by McCullagh and Nairn of Saint Stephen’s Green, Dublin. There are rendered walls with buttresses and a render plaque, pointed-arch openings with timber sliding sash windows that have hood-mouldings and some stained glass. The memorial stone was laid on 23 October 1906. The porch on the north-west side is a recent addition. Six years after his church in Nenagh was completed, Lundy’s architectural career came to an end and in 1912 he emigrated to Canada to farm, leaving his younger brother, Hubert John Lundy, in the Dublin office. Henry Lundy eventually returned to Ireland about 1953 and died while staying with his brother Hubert in Dublin on 5 January 1964. In recent years, this former Presbyterian church has been converted for local authority offices but retains much of its original form. The gabled street façade and large pointed-arch window identify it clearly as a former church, it retains interesting features, including the buttresses, plaque, hood-moulding and ridge crestings. The former church now serves as the town’s tourist office, conveniently located in the town centre beside the Arts Centre and close to Nenagh Castle, its churches, courthouse and other buildings of architectural interest. 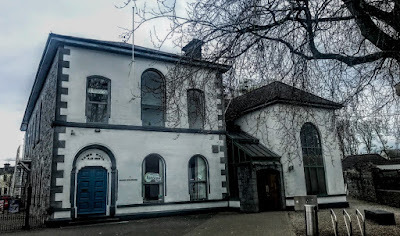 Beside Lundy’s church, the former Town Hall, now Nenagh Arts Centre, stands on the corner of Banba Square and O’Rahilly Street, and was built in 1885-1889. This town hall was designed by the Nenagh-born engineer and architect, Robert Paul Gill (1863-1928). Robert Paul Gill was born in Nenagh in 1863 and baptised in Saint Mary’s Church on 10 July 1863. His father, Robert Gill, was an assistant county surveyor for Co Tipperary and was responsible for providing Nenagh’s town water supply in 1891. Gill was a student at Trinity College Dublin before serving a pupil with Marmaduke Backhouse in 1881-1883 and then with Thomas J Myles, engineer with the Midland Great Western Railway Co, in 1883-1884. His brother, Thomas Patrick Gill (1858-1931), was Home Rule MP for South Louth (1885-1892), a close ally of Charles Stewart Parnell and later secretary of the Department of Agriculture and Technical Instruction. In 1889, Gill became the architect of New Tipperary, a housing development on the edge of Tipperary town for the evicted tenants of the local landlord, Arthur Hugh Smith-Barry. Gill also became an assistant county surveyor in Co Tipperary, a post he held until at least 1922, town surveyor of Nenagh at the same time and engineer to Borrisokane Rural District Council. He also worked for the Congested Districts Board, actively promoting rural development and co-operative creameries. Gill also practised privately with John Ousley Moynan as Moynan and Gill, and his son Owen joined the practice when he returned home from World War I. Gill also farmed at Fattheen House near Nenagh. His first wife, Margaret Mary (‘Daisy’) Stephens, was from Borrisokane, and they were the parent of nine children; his second wife, Mary Hourigan, was from Limerick, and they were the parents of three more children. Gill died in 1928. His youngest son, Tomas MacGiolla (1924-2010), later became TD for Dublin West and President of the Workers Party. Gill’s town hall was built in 1889 on the site of Nenagh’s old turf market. This is a gable-fronted two-storey building, with a three-bay front elevation, six-bay side elevations and later extensions at the south-east and north sides. Its noticeable features include the round-headed doorcase with a carved limestone archivolt on engaged square columns with capitals carved with acorns and oak leaves, its symmetry of form, and the well-executed stone decorative features. The Town Hall was refurbished as Nenagh Arts Centre in 2010. It has a state-of-the-art theatre it offers a wide programme, including films, plays, music and children’s theatre.